We meet in a big Methodist church. Our members are Christian, Jewish, and Other. We all get along. Members of our weaving guild have always shown respect for each other’s varying religions. We wish each other happiness in all holidays. Religion rarely interferes with weaving. I had heard, and repeated the rumor that mixing fibers was a biblical no-no. Having been raised in the New Testament now world of Roman Catholicism, I didn’t have to worry about anything from Leviticus (xix, 19), and Deuteronomy (xxii, 11). I found humor in the ruling. An Orthodox Jewish weaving student did not. This was not a concern until our home study group chose mixed warps for our focus last year. 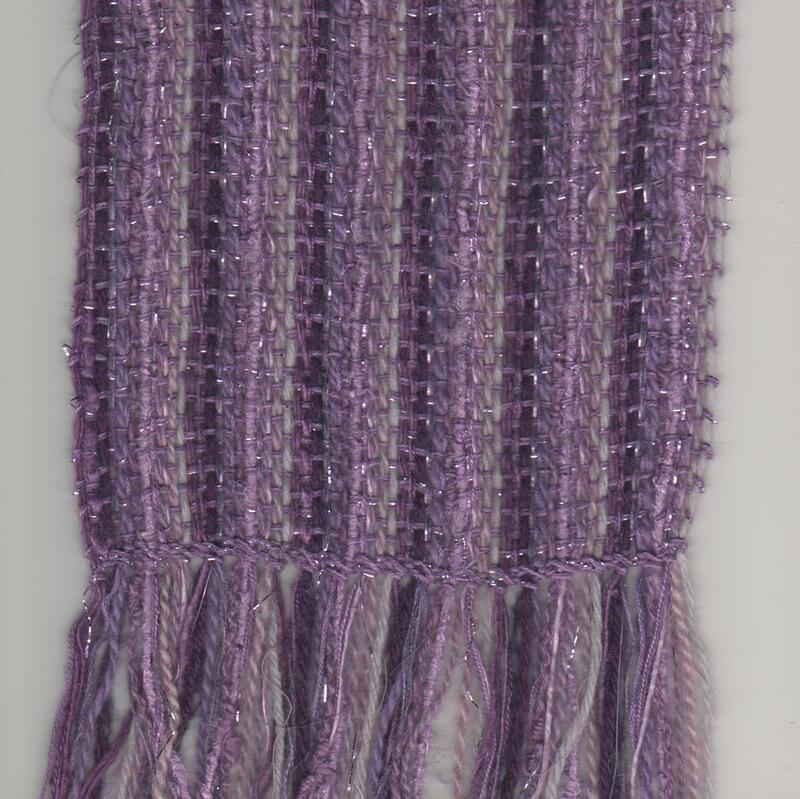 I combined 21 different purple threads and repeated it 6 times to make my warp. Linen and wool lined up, side-by-side, again and again, across the scarf. I assumed such flagrant rule breaking would doom me to damnation, and proclaimed my home study homework my “going to hell” scarf. I really wasn’t worried, but others might be, so I did a little more research. I called and asked Rabbi Granatstein of the Green Road Temple (very orthodox I’m told) to please explain the rules and consequences of disregarding them. He first explained that Jewish rules only apply to Jews. Gentiles in general don’t have to worry about being kosher. That left me totally in the clear. Having concern for the souls of my friends and future students, I continued questioning. The Rabbi started with the issue of cloth. It all goes back to Cain (flax grower) and Able ( sheepherder), and the first family feud. Citing the Biblical Law of Diverse Kinds, a shaatnez ruling forbids the union of linen and wool. The rule forbids the wearing of cloth made with linen and wool. It does not forbid the weaving of the cloth, or carrying it to market. It even allows for the modeling of it as long as it’s in the attempt to sell it. An Orthodox Jew can weave it, transport it, sell it or give it away without soul searching. They should not gift or sell a mixed warp garment to another Orthodox Jew, or keep it for themselves, but that’s as far as it goes. Then Rabbi Granatstein patiently explained that the Jewish religion did indeed hold the concept of Hell, but he did not assume so small a sin could earn someone a ticket. It’s a comfort. Weavers have enough challenges without accidentally backing into brimstone.